Last week Jews celebrated the High Holy Days by pausing and reflecting on the past year, both personally and as a community. JWA’s fiscal calendar happens to align with the Jewish calendar and, as a result, we have been reflecting as an organization on the previous year: What have we accomplished? What have we learned from things that did not work the way we expected? What are our goals for next year? Despite the struggling economy, it has definitely been a busy and productive year for us at JWA. Looking back, we are proud of what we have accomplished in 5770 (otherwise known as FY 2010). 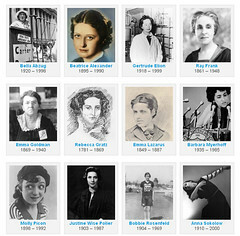 To celebrate Women’s History Month 2010, JWA launched On the Map, an interactive feature that uses Google Map technology to tap the democratic potential of the Internet to identify landmarks places that are important to the story of Jewish women in North America. Since then, more than 100 landmarks have been added to the map. This was a terrific blend of educators from various backgrounds who came together and lit each other up. We learned, inspired, taught, listened, laughed and developed ideas that will benefit our students and colleagues — like ripples on a lake. This is far-reaching and wonderful! The civil rights curriculum – which includes lesson plans, primary sources, and multi-media content – will be available online, free and accessible to all, by the end of September. We have already begun working on the second part of Living the Legacy — a module that will focus on the role of Jews in the Labor Movement. To make sure that our existing content stays current, and searchable, we redesigned our History Makers exhibit that not only improved the look of the exhibit we used to call “Women of Valor,” but made it easier for people with disabilities to access. It also improved our search engine rankings; our link now appears prominently in Google search results; for many of our History Makers, jwa.org is second only to Wikipedia. We also gave our email communications a makeover. If you haven’t seen the new look, sign up! Photos from JWA’s trip to Santa Fe. This year, JWA worked with the National Museum of American Jewish History and the Jewish American Heritage Month Coalition to make sure that wherever Jewish history was on display, Jewish women’s stories would be included. We also went out in the community, partnering with other organizations to organize stimulating events, panels, workshops, and exhibits all over the country. In March, JWA led a trip to Santa Fe to explore the rich mix that uniquely defines Santa Fe’s Jewish experience. Thanks to your support, we were able to make this past year productive and fruitful at JWA. If you are excited as we are about the year to come, please consider making a donation to the Jewish Women’s Archive. With your support, we can continue to build innovative educational tools and materials, develop new web content, maintain and improve access to existing content, and continue working with the Jewish community to shape a more inclusive future. This was originally posted at Jewesses with Attitude.